You can set a date and time to schedule automatic closing of your survey in the collector settings. These settings are bound to each of your collectors. By default, closing is set to “Manually”. Your collector will stay active until you close it yourself manually. 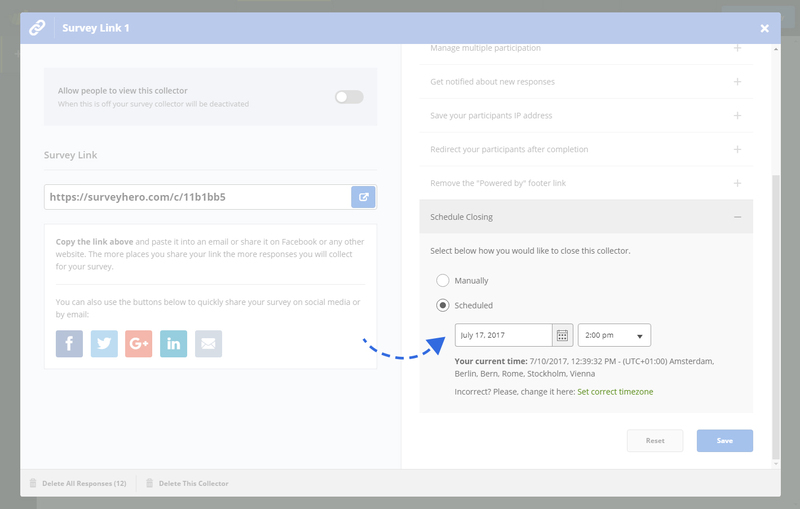 If you choose the “Scheduled” option, then the collector will automatically close on the date and time you choose. You can choose any future date and time. After the scheduled time, the survey will no longer be able to collect any responses. You can manually re-activate the collector at any time or if you wish to cancel the automatic closing, simply go back into the collector settings, select “Manually” and save. The time displayed in the collector settings will be based on the timezone you have set in your account. You can change the timezone in the “General Settings” area if the wrong one is set.